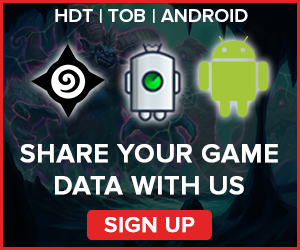 A weekly Hearthstone Meta Report based on data from over 60,000 games. 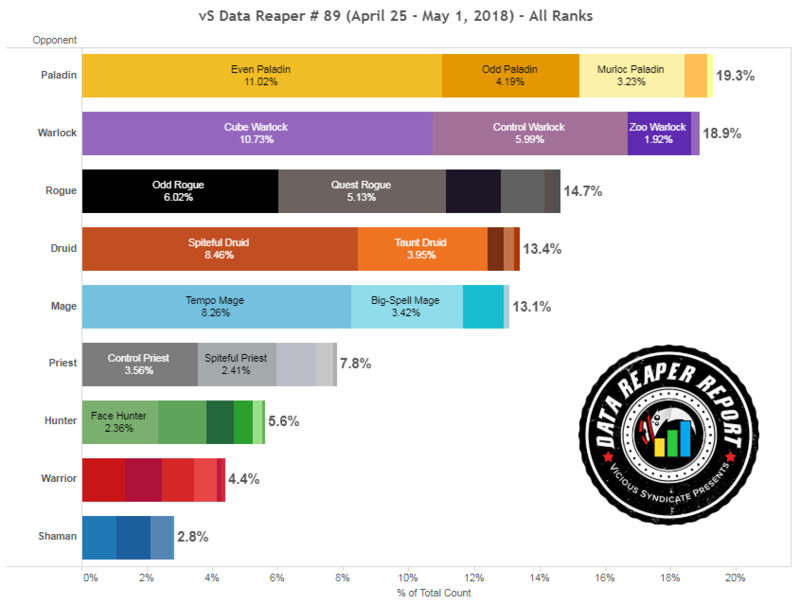 Welcome to the 89th edition of the Data Reaper Report! Our Data Reaper Project, including the Data Reaper Live has 3,200 active contributors and we thank them wholeheartedly. 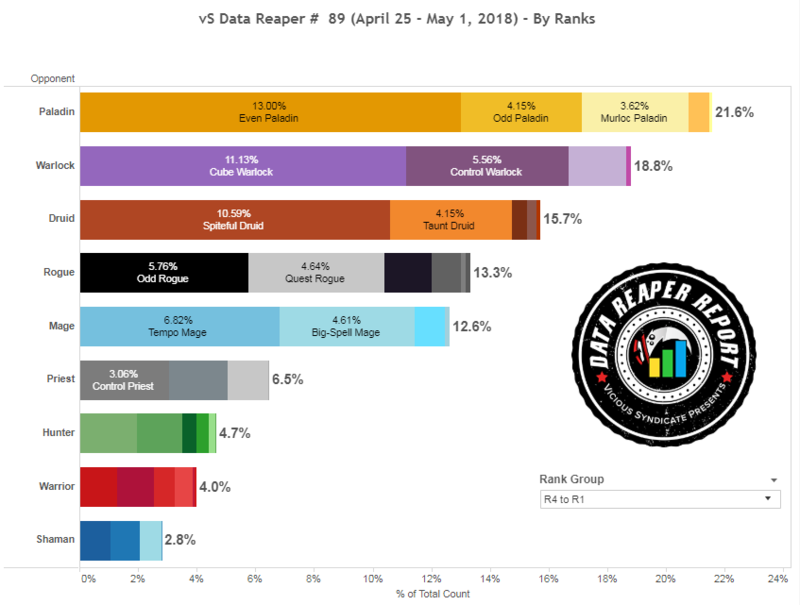 Contributing to the Data Reaper project through either Track-o-Bot or Hearthstone Deck Tracker (recommended) allows us to perform our analyses and to issue the weekly reports. Without the community’s contribution, there would be no project. Contributing data is very easy and takes a few simple steps, after which no other action is required. 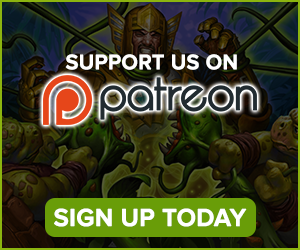 If you enjoy our content, and would like to make sure it remains consistent and free- Sign Up! 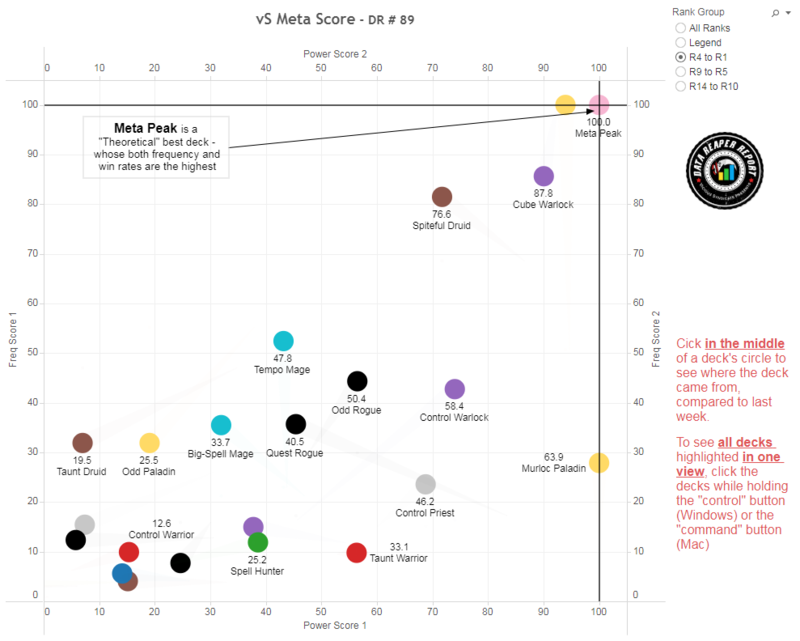 The meta is still very far from stabilization. This week sees Warlock spike in popularity at all levels of play, taking the #1 spot in prevalence at legend ranks. The class has also been shifting internally. Cube Warlock has actually declined in play, and it’s Control Warlock that has exploded, nearly tripling its numbers at legend. 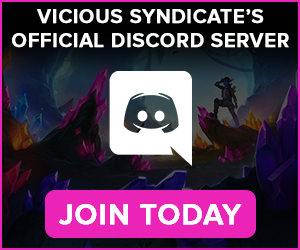 The archetype was very niche in the early days of WW, but has quickly turned into one of the most influential strategies in the game seemingly overnight, following the high legend success of many players. The rise of Warlock was likely a response to the rise of Paladin. Even Paladin is the most popular archetype in the game at legend ranks, and with its increased popularity, it has also seen an internal improvement of its builds, challenging the meta to counter it or fall to the wayside. Murloc Paladin has also increased in play, while Odd Paladin continues its gradual decline. At legend ranks, Odd Paladin is a rare sight these days. Rogue has increased in play at lower skill levels while taking a small step back at legend ranks, where players were already fully aware of the strength of the class. 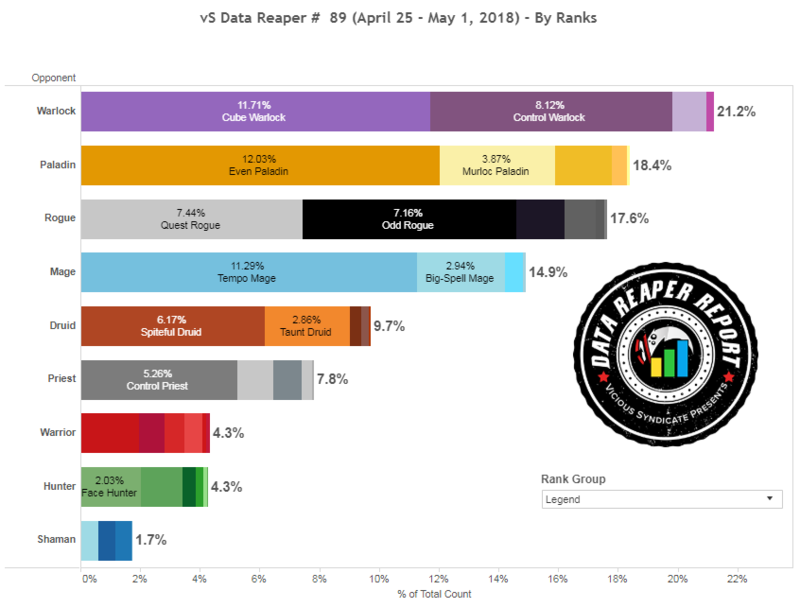 Quest and Odd Rogue have grown in their numbers and are the primary archetypes making up most of the class’ numbers, while Miracle and Tempo Rogue continue to shrink in their meta share. Mage has made a massive comeback this week, rising in popularity at all levels of play. This was the result of the recent success of Tempo Mage, a popular answer to the Quest Rogue/Warlock field, especially at the highest levels of play. The increase in Mage’s prevalence has huge ramifications on the state of the meta, which we will discuss later. With seemingly every class rising in play, someone had to fall, and it starts with Druid. Taunt Druid has seen all of its hype evaporate into thin air as the deck drastically collapsed in its numbers at all levels of play, especially at legend ranks. Spiteful Druid is relatively unaffected outside of legend, though a dip in its prevalence at legend is noticeable. Overall, meta trends have not been kind to the class, and it’s now sitting in the middle of the pack. Priest is in the midst of a big transition from a class full of experimentation to one that’s much more meta driven. We see it with the decline of many of its unsuccessful archetypes, and the drastic increase in Control Priest’s numbers. The archetype has doubled its numbers at legend ranks and should be fully anticipated when queuing into a Priest at this point. Its growth is still an ongoing trend. Face Hunter’s continuing collapse sees Hunter numbers crash. The class is seeing a lot of experimentation, but Spell Hunter is the only other archetype that has established somewhat of a steady presence in the meta, albeit a very small one. Warrior is also failing to gain traction and is still running high with experiments. Control Warrior is the most popular and established archetype, while the rest of the class is comprised of a fraction of off-meta decks seeking relevance. Shaman is at the bottom of the barrel, and has dipped below 2% of the meta at legend. It’s quickly reaching its K&C nunbers, which isn’t a good sign if you’re a fan of the class. Thrall’s decks are quickly dying, and players seem to have stopped trying. Shudderwock’s claws haven’t caught anything lately. The meta has been shattered to pieces, and at the core of the drastic changes is the monumental collapse of Quest Rogue’s win rate. This comes as no surprise if you consider the massive spike in Tempo Mages and the decline of some of Quest Rogue’s prey, such as Taunt Druid, especially at legend. The increased prevalence of a matchup Quest Rogue loses over 80% of the time has proven to be absolutely crippling to its consistency. Quest Rogue’s influence on the meta is certainly there, but once again it finds itself relentlessly countered as it quickly develops a target on its back. The archetype is still strong enough to yield success, but its success is now more situational and comes with caveats, compared to the situation a couple of weeks ago. You have to be very mindful of the matchups you’re seeing if you want to queue it up. Its polarizing matchups and incredible power against a portion of the meta will likely keep it relevant on ladder, especially at high legend ranks, but its overall win rate means it should not grow further in popularity. Paladin is also feeling the heat and its two T1 archetypes, Even Paladin and Murloc Paladin, have taken big hits to their win rates at legend rank. 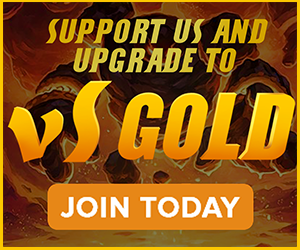 Since its inception, Even Paladin has been constantly refined to deal with the threat of Cube Warlock, so much so that the matchup has become fairly close. With the lack of reliable counters, this development threatened the possibility of the archetype spinning out of control, and the response from the meta has been ruthless. The transition to Control Warlock and its refinement brought about a new and much more hostile opponent to Even Paladin, one that is not affected by its Ooze tech and has a few more board clears at its top end to deplete it from resources. The rise of Control Warlock has successfully kept Paladin in check, and could also lead to an increase in the meta’s diversity in the future. Cube Warlock is still a very powerful deck, but the decline in its win rate is a continuing trend which started at the early days of the expansion. More and more archetypes have now curated their builds to be most effective against it, and Cube is not immune to being countered. However, Control Warlock is definitely not a strictly better choice when we consider a diverse field of opponents. Control Warlock is a more polarizing deck with clear strengths and weaknesses, while Cube Warlock is a well-rounded deck that’s more difficult to counter since it doesn’t have truly bad matchups. Both have their place in the metagame, and should maintain that place going forward. Out of the battle between Paladin and Warlock, one winner emerges, and that is Control Priest. The archetype has skyrocketed in its win rate, narrowly taking the #1 spot in our legend table. Last week, we discussed Control Priest as a potential Meta Breaker “if not for Quest Rogue.” Its dominating matchup against Even Paladin, as well as its decent standing against the Paladin and Warlock classes in general was very promising. With the decline of the Druid class, the halt in Quest Rogue’s growth and the increase in Paladins and Warlocks, Control Priest found itself thriving. An increase in the archetype’s presence would level the playing field when it comes to game balance, so this is an encouraging development that could move us away from a purely Paladin/Warlock dominated meta. While the strength of Quest Rogue against the field will likely ebb and flow, Odd Rogue is just a strong, pure aggro deck that has enjoyed a climb in its win rate along with a successful phase of refinement. Tempo Rogue is falling to the wayside due to its redundancy when compared to Odd Rogue and the lack of development in its builds. Miracle Rogue is a narrow, yet effective, counter to control decks that also has a favorable matchup against Quest Rogue, so we could see it being successful in certain ladder situations and tournament line ups despite its poor ladder win rate overall. Rogue is not going anywhere, but it’s unlikely to dominate the field from this point on. Spiteful Druid continues to display strong results, though it has taken a significant hit in its win rate due to the rest of the field catching up. It will likely remain a strong all-around deck, but it doesn’t carry an advantage against Warlock and Paladin, so it cannot unseat them from their current position. Taunt Druid’s success is much more meta dependent since it is heavily punished by Paladins and Quest Rogues. It’s a dominating counter to Control Warlock, and a strong counter to passive decks in general, so it’s a solid choice in anti-control tournament line ups. While Tempo Mage has exploded in popularity, its win rate has not followed suit and it remains hovering around the 50% mark. Tempo Mage thrives in a Warlock dominated meta, and has the added bonus of countering Quest Rogue, but its success can be limited by the presence of Paladin. Much like in the K&C meta, it cannot handle the consistent wide board Paladins generate through Call to Arms. We see Tempo Mage as an archetype that will continue to chase Quest Rogue around if it becomes overbearing, but could take a step back once it’s “done its job”. A possible under-the-radar ladder deck at the moment is Spell Hunter. The increased presence of Tempo Mage has greatly benefitted the archetype, and it has now surpassed the 50% mark at legend. The deck isn’t as powerful as it used to be, and will likely have to continue to hide from Warlocks, but its respectable win rate gives hope that when the dust finally settles on this meta, Hunter will not be a dead class. Face Hunter, on the other hand, has too many dark red matchups. Hope has also reached the Warrior class. Control Warrior appears to be meeting our expectations of a steady improvement over time. It has a surprisingly good matchup against Cube Warlock due to some serious tech and holds a very respectable and competitive win rate overall (Control Warlock is a different story, where Rin/Pact has little counterplay beyond running Azalina Soulthief). Taunt Warrior also looks very competitive for ladder play, though it’s an extremely polarizing deck that can be frustrating when queuing into the wrong kind of opponents. Still though, these are signs that Warrior could find a place in the WW meta. 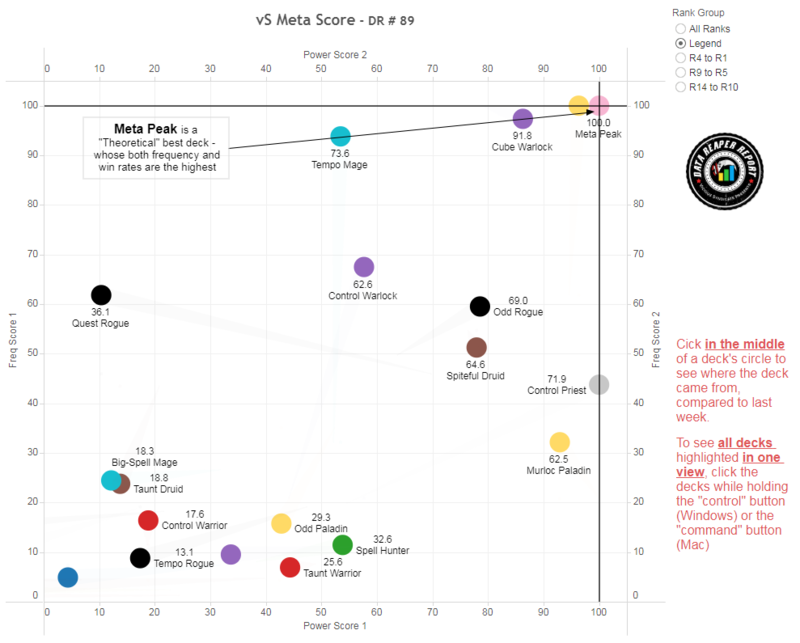 Overall, we think the meta is fairly balanced at the moment. The threat of Quest Rogue has been kept in check and we’re seeing strategies of different ends of the meta spectrum having success. 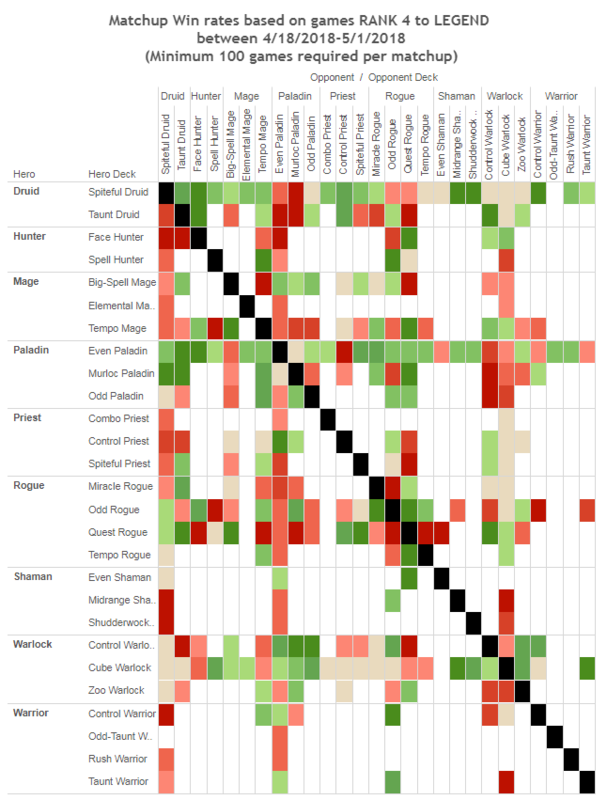 Nineteen different archetypes from all classes are listed to carry a win rate of 47%+ at legend, while no deck is carrying an oppressively high win rate either. The rotation has done a lot of good for the game. 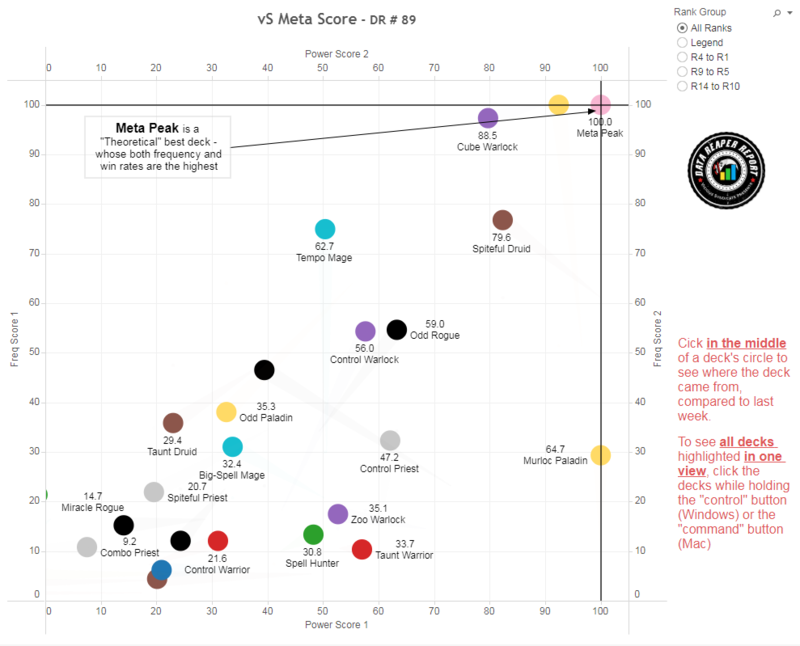 The main issue of the current meta is the lack of impact from the WW expansion itself. Most of the primary meta decks are slightly modified versions of themselves from K&C with not many new cards included. WW has not created many brand new archetypes either, which could result in the meta feeling stale sooner than usual. It’s a difficult balance to create a strong enough set of cards that changes the meta while not being overbearingly powerful. WW and K&C are two very contrasting examples of that. Warlock is the most defining control litmus test in the format. However, predators have begun to emerge and the class has had to diversify as a result. While taking a small step back in its prevalence, Cube Warlock remains highly played and has seen little variance in its builds. The occasional inclusion of Lord Godfrey is the most common tech card that we’re seeing, usually replacing a Mortal Coil (Feno hit #9 legend with this variation). In a heavy Warlock meta where mirrors are common, cutting both Coils for utility cards such as Spellbreaker makes a lot of sense, and it might be the direction the archetype is headed towards eventually. Be mindful that Cube has been seeing a more hostile meta in recent days, and a few decks have improved their matchup against it during the process of their refinement, a good example being Even Paladin. With Cube Warlock having a target on its back, many players have been turning to Control Warlock, which has significantly increased in its popularity over the past week. Control Warlock has evolved into a much more reliable counter to Paladin and many players took advantage of this matchup to hit high legend ranks. Sooni hit #1 legend with a list that includes a couple of tech cards and is heavy on early defense. The list featured in this report slightly differs by cutting Siphon Soul for the 2nd copy of Twisting Nether. While Control Warlock has certainly improved its standing against the field, its matchups are far more polarizing than Cube’s, and it gets punished by decks such as Taunt Druid and Quest Rogue. Be mindful of the differences between Cube and Control Warlock when deciding between them. Zoo Warlock is still something of an enigma in this metagame. The archetype remains neglected yet still performs well enough to merit some exploration. We have no significant news on it this week, and are watiing to see whether a few players pick up the Zoo ball and run with it. The big news in the world of Paladin this week is the staggering fall of Odd Paladin. With the rise and refinement of Even Paladin, as well as the continued popularity of Warlocks on ladder, the meta is just not really ripe anymore for Odd Paladin’s brand of breakneck aggression. Even Paladin has proven to be incredibly consistent against everything but the most powerful AOE wielding strategies, such as Control Warlock, Control Priest and Big-Spell Mage. Call to Arms is the heart and soul of this deck, as it is the engine that drives the consistency of Paladin’s midgame. The interesting development this week comes in the form of Narra’s Val’anyr build. This list aims to improve the matchups against the deck’s biggest counters. The relatively underwhelming Silver Hand package of Jailor/Stegodon is cut to make way for Argent Commanders, Saronite Chain Gangs along with Val’anyr and Loot Hoarders. The build focuses on burst from hand, which makes it harder for Warlocks to stabilize beyond your reach. Murloc Paladin is still extremely strong as well, but is just not seeing the same level of representation as most of the spotlight and attention is given to Even Paladin. Make no mistake, this archetype is just as strong against the field as Even Paladin, and is arguably a stronger deck in the tournament scene as well, since it dodges some of the counter line ups aimed to lock out Even Paladin. Odd Paladin is not a great choice anymore when compared to the aforementioned. Once the meta settled down and players realized the archetype’s limitations, it fell off in both win rate and play rate. Odd Paladin just doesn’t have the comeback mechanics to provide any significant resistance to Warlocks, while other aggressive decks are just faster and more reliable counters to Quest Rogue. Rogue remains highly represented at legend Ranks, and the shadows have started to proliferate down the ladder. Quest Rogue continues to see significant play at legend ranks, though the meta has pivoted to close the Caverns Below as quickly as they reopened. Tempo Mage’s enormous increase in popularity at legend ranks has hamstrung Quest Rogue over the past week, while strategies that fall prey to Quest Rogue, such as Taunt Druid, faded away. With that being said, if you want to beat slow decks, Quest Rogue is still the most reliable way to do it. One interesting point of discussion when it comes to Quest Rogue is its removal options. Sap, Fan of Knives and Backstab are relatively underwhelming in the deck, but provide options that help against specific strategies. Valeera the Hollow can be the difference between comfortably winning a game and being grinded out. The Elemental package helps improve the consistency of quest completion while providing fuel post-completion, but can be slow and is weak to silence effects. Both the Igneous and the non-Igneous approach are viable options for ladder. Odd Rogue has seen significant growth as the new reincarnation of aggressive Rogue decks. Its ability to control the board while applying pressure in the early game is highly effective. Mid-game cards such as Cobalt Scalebane and Captain Greenskin have been sneaking into lists, as the archetype has become slightly slower and more resilient to board clears. Even Bittertide Hydra is currently being experimented with at the 5 slot. Glaser and Swaggermeist have had recent high legend success with similar builds. Ironbeak Owl is strictly a Warlock tech, so its inclusion is entirely dependent on the presence of the class. Miracle Rogue is not doing too well by most metrics, though dedicated Miracle players continue to stick with it for this expansion as well. Gyong hit #1 legend by including 28 pre-rotation cards and 2 Hench-Clan Thugs. 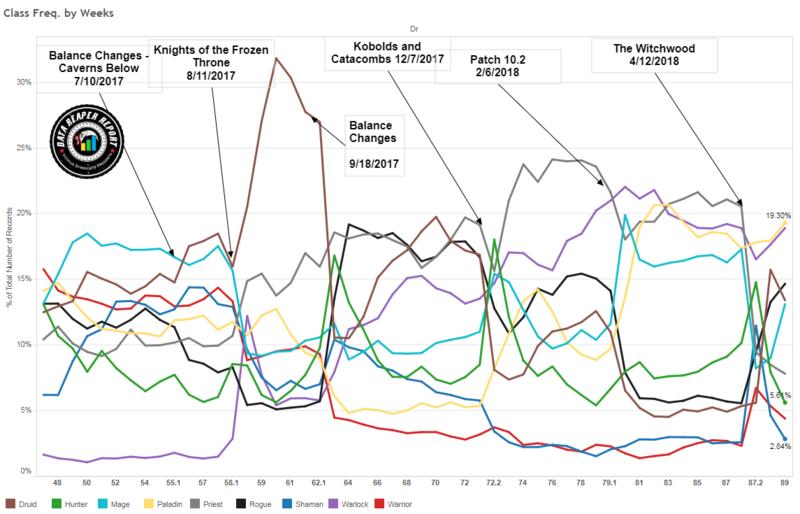 Mage has had a huge week, with a very significant spike in popularity as a result of Tempo Mage’s resurgence. With Quest Rogue and Warlocks running rampant, the deck has enjoyed a lot of success at high legend ranks, with a long list of players posting good results with the archetype. While the meta surrounding Tempo Mage has changed, the deck itself has not. There are 27-28 cards that are considered to be core, and the other slots are occupied by filler cards. Option for the flex slots include: Fire Fly, Amani Berserker, Bloodmage Thalnos, Mirror Images and Arcane Keysmith. The list featured was taken to #2 legend by Furyhunter, who chose the early drops in order to shore up the deck’s 1-2 curve, which helps against Paladins. Several players hit top 10 legend by running different combinations at these flex spots. Needless to say, as long as the core is there, it’s hard to go wrong with Mage while the meta is favorable. Big-Spell Mage is not so lucky. While the archetype is one of the strongest counters to Even Paladin, it suffers from too many poor matchups against too many of the top ladder decks, including Tempo Mage. Much like last expansion, there are fewer players reaching for Druid to finish their seasons. Spiteful Druid leads the class in play rate and win rate but has not seen too many developments this week. FroStee hit #16 legend with a Spiteful list that runs Druid of the Scythe and one Druid of the Claw, which provide the deck with more immediate impact minions. Thijs had an early month tear through ladder with a similar build that his team, G2, is bringing to the EU playoffs. Taunt Druid has seen some deviation from its early iterations. Mage hit #7 legend with a build that drops some of the late game cards for Wraths and Mossy Horror. The extra removal is meant to improve percentages against aggressive decks. Mossy Horror doubles up as a target recruit body for Oakheart instead of Dragonhatcher. Taunt Druid is an exceptional choice when you are queuing into slow control decks, but falls short against Quest Rogue and Paladins that do not allow the Druid to execute its powerful yet very slow win condition. Finally, Token Druid is a rare sight on ladder but continues to produce decent results. Krea’s build is the latest take on the archetype. With Violet Teachers and Power of the Wild, the list plays out quite similarly to the old Midrange Token Druid decks from years ago. This deck is quite good against the field, able to contest most strategies quite effectively, but suffers from a terrible Warlock matchup. 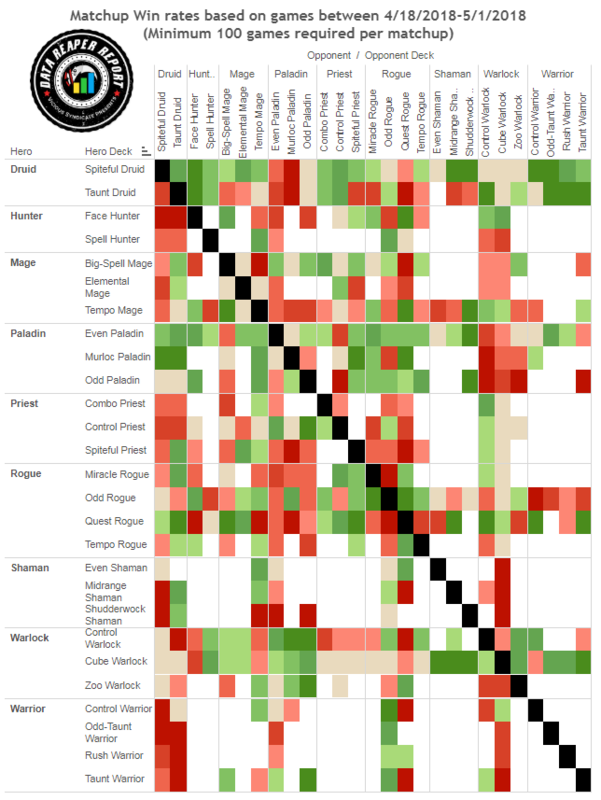 Last week we touched on the fact that Spiteful Priest, despite being the inferior Priest archetype, was seeing the most play out of any Priest deck. Since then, the public has caught on. 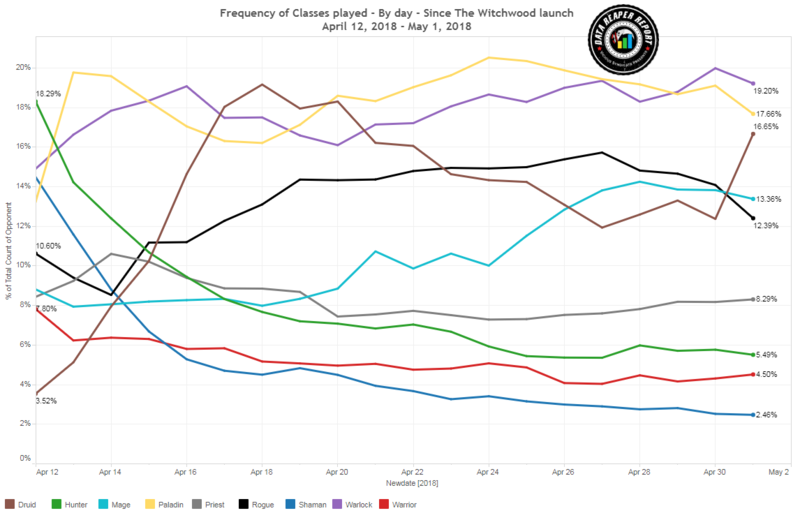 Spiteful Priest saw a huge decline in play since our last report, and Control Priest saw a nice jump, practically taking over the class and representing it as the sole relevant strategy at legend ranks. Control Priest has been a sleeper performer in this meta on the back of good matchups against both Warlock and Paladin, and over the past week, it has had a very long list of success stories at top legend ranks. 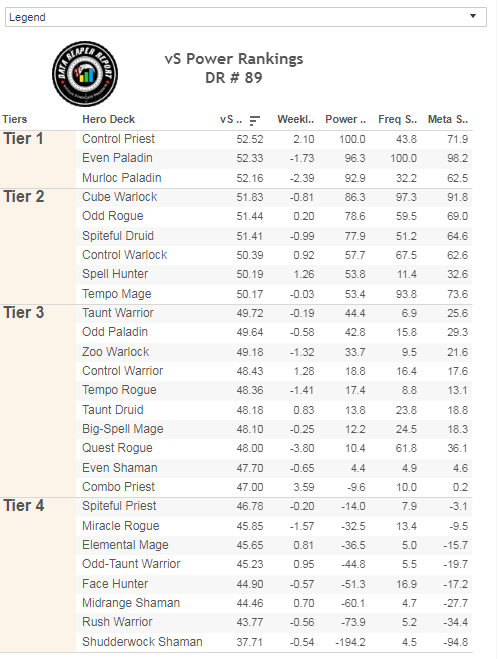 This showcases the archetype’s good position in the current meta, perhaps more so now that both Quest Rogue and the Druid class have produced relatively lukewarm results lately. The standard build has seen changes, with Acolyte of Pain being introduced in an effort to improve the deck’s consistency in finding its combo finisher. This has had a positive effect on the deck’s win rate. Furthermore, Skulking Geist has found its way to the build. Geist is meant to eliminate Dark Pacts in the matchup against Warlock, preventing your opponent from being able to burst heal after an Alexstrasza set-up. All forms of weapon destruction see play in this deck: Harrison Jones, Gluttonous Ooze and Acidic Swamp Ooze. The choice between them is dependent on the matchups you’re facing and whether the bonus effects of Harrison Jones and Gluttonous Ooze are relevant. Finally, the last point of debate is whether to run Shadow Word: Death. SW: Death can be a valuable removal tool against Cube Warlock, while cutting it improves your Shadow Visions consistency. The featured list was taken to #5 legend by Cydonia, and most top legend builds deviate by the 1 or 2 cards we’ve discussed. Things aren’t great for Warrior, but for now it’s still a slight improvement on the Kobolds & Catacombs meta. The class still sees very little play, but there are several acceptable deck archetypes, some of which are even seeing moderate ladder success. Remember Wallet Warrior from years ago? It’s back. Odd-Control Warrior seems like the best way to play Control Warrior at the moment, with FibEli3 reaching #13 with a Furyhunter inspired list consisting of 12 epics and 6 legendaries. The deck makes use of Tank Up! to stack plenty of armor early on, and provide fuel for Shield Slam and Reckless Flurry. The combination of armor stacking, anti-aggro cards and the inevitability of Elise make for a fairly solid deck. While Spell Hunter remained at a consistent playrate this week, Face Hunter took a big hit, with numbers shrinking nearly in half. Players are realizing just how weak Face Hunter is to nearly every deck on ladder other than Warlock and Quest Rogue. 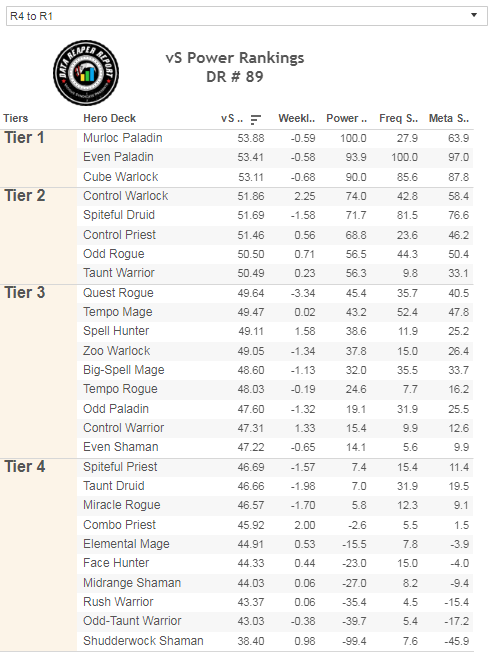 Paladins are a particularly awful matchups for the deck, which absolutely kills its chances of consistent success in the current meta. At legend, nearly all the high ranks achieved by Hunters are by Spell Hunters rather than Face Hunters. Face Hunter is a quickly dying archetype and will likely be extinct unless there is significant innovation to the build or a drastic change to the meta. 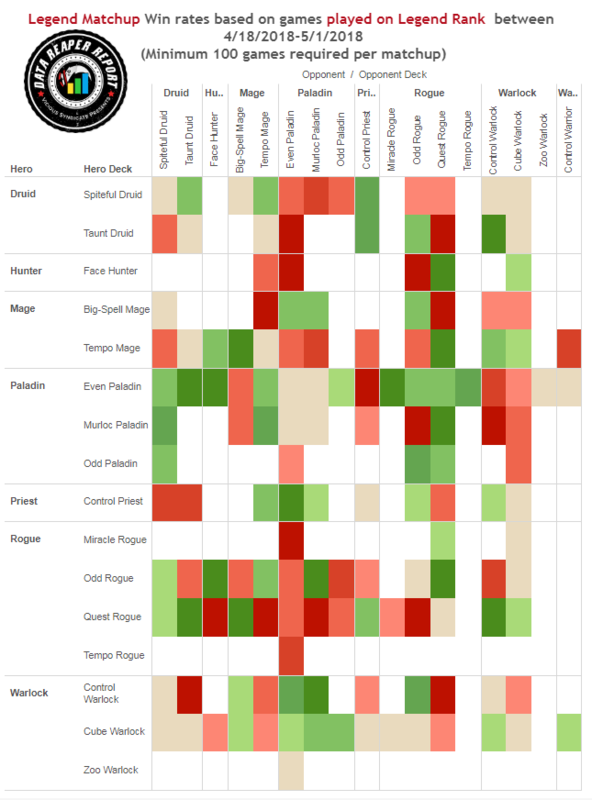 Spell Hunter lists are fairly stagnant, with the only major debate in lists being Arcane Shot versus Grievous Bite versus Wing Blast. It mainly comes down to a meta call with these cards, having to judge the amount of Paladins against the amount of Warlocks. Grievous Bite can do wonders in slowing down the game against Paladin but is extremely weak against Warlocks, while Arcane Shot is a solid removal tool for the early game while being more useful against Warlocks since it can hit them in the face. Wing Blast might be the strongest card in tempo matchups, but similarly to Grievous Bite, it’s weak against Warlock. Crownajke recently hit #10 legend with an Arcane Shot build. Well, it was fun while it lasted. Shaman’s brief time in the sun is pretty much over as the class’ usage rate plummets back to pre-Witchwood levels. Shudderwock Combo Shaman has almost completely faded away. The deck might still have a niche as a control killer, but Quest Rogue does the same job far more effectively. Rage has had high legend success with a different take that runs Bogshaper alongside a cheap spell package. Even Shaman is the best performing archetype for the class, but its main issue is dealing with Warlocks. Though the deck is quite competent against most of the field, this one horrible matchup and the sense of hopelessness against the Warlock’s AOE tools makes it difficult for players to embrace. Shaman could spend another 4 months in the bottom of the play rates if things don’t change soon. With a plethora of powerful AOE spells that can continuously wipe Paladin boards, as well as a burst finisher that bypasses taunt walls, Control Priest carries the perfect combination of tools that allows it to bully Paladins while holding its own against Warlocks, making it the strongest deck in the game in a Warlock/Paladin dominated meta. In addition to its standing in the meta, the deck has undergone several improvements in its build, gearing it towards a combo-centric nature, with a focus on card draw that takes a page out of Raza Priest’s book. Control Priest is also fairly difficult to play according to our metrics. One of the biggest mistakes beginners make, for example, is playing Shadow Visions too early when a clear need for a specific card is not there. Be mindful of your current resources and what’s required in a specific matchup, and you’ll see an immediate improvement in your results. The Thrall and Garrosh stories are continuing on their own! Now named A Song of Fiery War Axe & Ice Breaker, a new story will be posted at every Sunday. Time may vary due to other scheduled articles, but most commonly at 9am PDT. Click the banner below to read the latest installment of A Song of Fiery War Axe & Ice Breaker. Our Data Reaper Project, including the Data Reaper Live has 3,200 active contributors. Without them, this project would not be possible, so we’d like to thank all of our contributors for their help. Special thanks to Leo G, Chungfr, Kognar, Aaron B, Jed M, Drew M, Alan J, Eric L, Jeffee83, Zolstar, Pink Mage Diaries, Eric H, Lim E, Sean H, Steve F, Andrew N, NObdy, Mark S, Andrew, Alonso P, msKang, Andrew R, and Andrew H for supporting us for the month of May. A HUGE thank you to our Tier 5 Patron(s): ByteCookie! Is there not enough room for silver sword in even pally?